It was a time of great demographic change in England; people moved a lot in search of work. 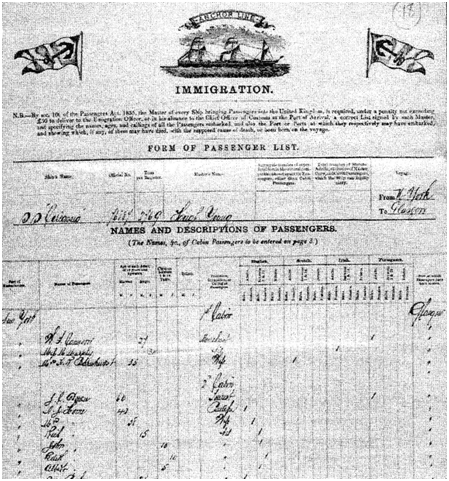 In the 1860s, Albert not only left home but left England, crossing the Atlantic to the United States. On 2 November 1873, he married Liverpudlian Mary Jones Hancock (1840-1912), daughter of a merchant ship captain, in the Protestant Episcopal Church of the Holy Communion, St. Louis, Missouri. The United States was coming out of civil war and expanding westwards and St. Louis was growing fast. It was the country’s fourth largest city after New York City, Philadelphia, and Chicago. On Independence Day 1874, 200,000 people watched a coal wagon, train and an elephant pass across the new iron Eads Bridge to test its carrying capacity. In 1877, the people of St. Louis were also involved in the United States’ first general strike, which was violently suppressed. The poet TS Eliot grew up in St. Louis in the 1890s, and wrote that the ‘Missouri and the Mississippi have made a deeper impression on me than any other part of the world’. His Four Quartets (Dry Salvages) has the words: ‘I do not know much about gods; but I think that the river Is a strong brown god – sullen, untamed and intractable’. Over the next eight years the Homes had four children: Richard Hancock Home (1874-1944), twins John Edwin (1878-1924, the authors grandfather) and Edith Mary Alberta Home (1878-1949), and Albert (1882-1953). 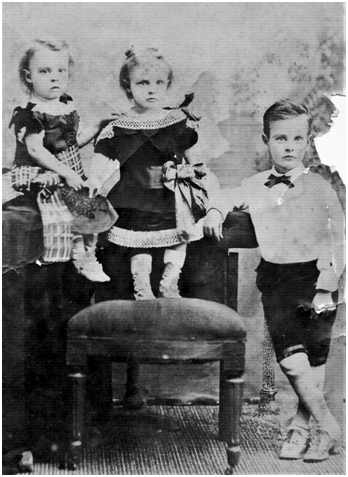 A studio photograph circa 1880 survives of the three older children, perhaps commissioned for relatives in England showing the family prospering in the New World. The fancy clothes may have been hired in the studio, so the reality could have been less fancy. By 1890 Albert James Home, aged 44 was back in the UK. In the census he is listed as a ‘retired master butcher’. This suggests that he did make some money in the United States. After the Civil War, and with the rapid growth of cities there was a lucrative new market for fresh meat served by overland cattle drives from the Great Plains of the Midwest, easily transported to St. Louis where more railroads met Louis than in any other city. However, by the 1870s efficient centralized stockyards were being created, and in the 1880s refrigerated cars allowed for the chilled beef trade, as carcasses weighed 60% less than the live animals. These developments hurt the smaller butchers that lacked economy of scale or quality controls. Perhaps these changes in the meat industry led to the Home family returning to England from the United States, or perhaps his mother being ill and his father dead since 1880 meant he had family business in the UK to attend to. They arrived in Glasgow from New York aboard the SS Circassia on 7 March 1890. Albert James’ mother had died a few weeks earlier on 8 January of bronchitis and heart disease in a terraced house in the Bristol district of Totterdown. In 1891, the family lived at 80 Belmont Road, Bristol, which continued to be their home for over sixty years. It was a recently built three-bedroom family house with a small garden front and rear in the up-and-coming district of St. Andrew’s. Shops and services were available a short walk away on Gloucester Road, and just around the corner a new public park opened in 1895. St. Andrews Park was later claimed as the city’s most beautiful park. In 1894 the eldest son, Richard Hancock Home, aged twenty, petitioned successfully on behalf of the family for Albert James to be admitted to the asylum in Fishponds. The recent 1890 Lunacy Act allowed family members to apply to a magistrate for a reception order, supported by two medical certificates, to detain a relative in an asylum. Families were the primary instigators of admissions for relatives who were ill, as it still is today. Admission to the asylum often came about when the behaviour of the relative became unmanageable by the family and/or had gone on for so long they sought help from the medical profession. The asylum system provided a safe place for those who were mentally ill. It had expanded in the second half of the nineteenth century following the 1845 Mental Health Act which stated every county had to have a safe place to support the recovery of the mentally ill. It was funded by the county rates as ‘Poor Law institutional relief outside the workhouse’, in recognition that people who were mentally ill were not fit to work and therefore the workhouse was not a suitable institution. However, it was more expensive to house a person in the asylum than a workhouse and county’s were reluctant to send people there unless the need was proven. Despite this, by 1920, 30% of the 270,000 Poor Law inmates were in lunatic asylums, and the numbers in asylums had grown from 53,000 in 1890 to 74,000 in 1900. The Bristol Lunatic Asylum opened in 1861, built in the suburbs of Bristol. The mentally ill were transferred from the overcrowded workhouse; St.Peter’s Hospital. The new hospital had extensive landscaped grounds and farm to provide for a self-sufficient community of staff and patients. Victorian asylum design owed much to the tenets of Moral Treatment, originated in the York Retreat that deemed and making use of space and light, with pleasant wards and open areas would support people to get better. They were progressive institutions and modeled on enlightened thinking, with no use of strait-jackets, providing patients with a safe place, outdoor exercise, some sort of work, a bed to sleep in and a decent well-balanced diet. Once a patient was admitted, its physicians operated on what they thought best, although they had to answer to the local council and the Lunacy Commissioners and Visitors. While there was supposedly no disgrace or discredit implied to the patents, as they were called after 1885 (instead of madman or lunatic), yet people were detained behind closed gates for their safety and the safety of others. The doctors did not have any medicines or treatment to offer at this time apart from sleep, healthy food, exercise, jobs within the hospital for those who were able and spiritual well-being. Amusements were provided for the patients, including billiards, croquet, bowls, a small library and a weekly concert. Smoking was allowed, and cricket organized. To the modern eye sleeping and living communally in wards with many beds inches apart and strict timetable for eating seems alarming. But for many having a bed to yourself and three meals a day would have been unheard of in their life outside the asylum. Of patients admitted from 1861-1900 about half recovered. Most patients were designated as paupers because they could not afford to pay for long-term asylum care, but often represented a broad cross-section of the population than that term implies. Petitioners might undertake to visit at least every six months but only about a quarter of the patients received visitors. Over half of patients were discharged as recovered or relieved. In 1906 a quarter of ‘able-bodied’ asylum inmates (ie not confined to bed) were over the age of 55. The admission books kept at the Bristol Records Office include the assessments of the admitting doctors, information given by relatives, and ongoing case notes. Albert James’ assessment has recurring mention of melancholia (depression), which was the asylum’s third most common diagnosis. His symptoms included wandering about at night claiming that others were conspiring against him and poisoning his food. According to the asylum records he had returned to the USA and tried to commit suicide there (those diagnosed with melancholia were often admitted after attempting suicide). The case notes indicating being an only child was a contributory factor. The lack of sibling relationships may have affected how he saw himself and interacted with others. Recent psychological research suggests only children tend to have less self-control and can exhibit confusion in understanding their relationship with peers. No sooner was he admitted than he tried to escape by climbing over a wall; he was restrained, and remained in the asylum until his death some sixteen years later in October 1910 of tuberculosis. His eldest son was the informant on the death certificate, just a few months before his second son, the author’s grandfather John Edwin was married in Bristol. At this time all patients were photographed soon after admission. 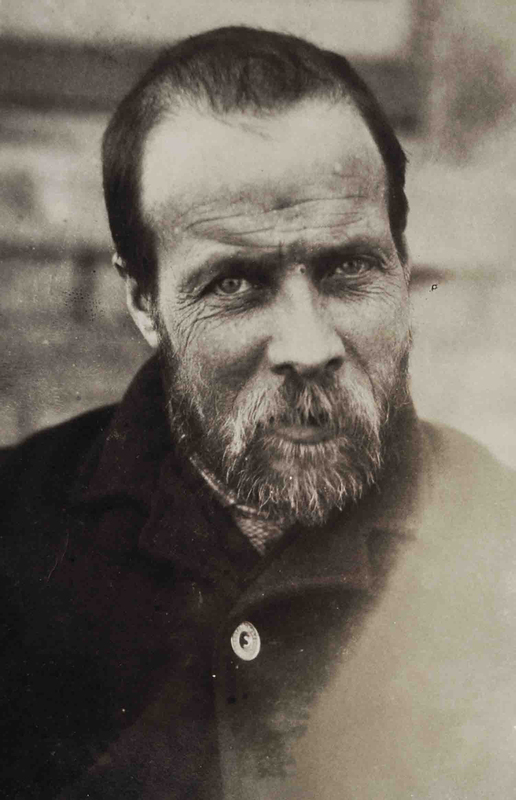 Albert James’ photograph shows a lined face with dark patches under sad eyes and untrimmed beard, but a direct and intelligent skeptical gaze with some hint of humour.